Previously, it has been necessary to construct remote monitoring solutions based on PC architecture with add-on cards. There are many problems associated with the PC-based solution for remote monitoring applications. First of all, a PC based remote monitoring solution is expensive and requires many components to set up. Second, the PC system is not designed to be rugged and tends to fail in outdoor environments with high temperatures or humidity. And finally, such systems require a lot of energy to operate. The CoCo by Crystal Instruments is an Ethernet based integrated solution for sound and vibration remote monitoring. It is small and lightweight, designed for industrial use, more reliable, and consumes only a fraction of the power of a PC-based instrument. Remotely control and monitor the CoCo through the Internet or through long distance wireless communication. The CoCo is used to monitor noise and vibration and store data at a remote site. Signals can be transferred over the Internet. Data can be viewed remotely with EDM software or on the Internet. Emails can be sent based on predefined criteria. Whether you are conducting structural testing, vibration monitoring in a plant, monitoring noise at an airport, or monitoring a wind turbine performance a thousand miles from the nearest internet connection, the Crystal Instruments Spider-80X meets all remote monitoring application needs. 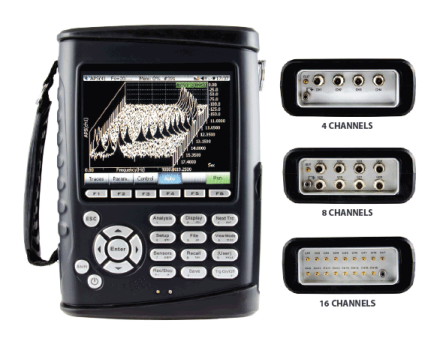 The Spider series are the first Digital Signal Analysis systems that are modular at the user-level. Most other instruments are only modular at the manufacturer level. For example, a VXI or PXI system consists of multiple plug-in cards that the manufacturer can configure. However it is not safe for the user to re-configure the systems with different modules. It is also impossible to divide the complete system into a few different systems and run them separately. Conversely, Spider modules are completely configurable by the user. If a company purchases two Spider-80X modules, they can use them as two separate 8-channel systems or combine them as one 16-channel system. Another benefit of the modularity is that users on a limited budget can start with a single 8 channel system, and then as the need and budget increase, they can simply purchase additional Spider modules to increase to a larger channel count system.